Even small families often outgrow their current homes. If it’s time for your family to look into more spacious housing, Oklahoma City, OK three-bedroom houses provide an abundance of space at an affordable price. Often times these houses feature a full bathroom and at least one additional half bath, as well as both a living and family room. While 3 bedrooms may seem like a lot for just 2-3 people, having the flexibility to utilize additional bedroom space for storage, a guest room, home office or even a playroom is a great option. For the price, Oklahoma City has a lot more to offer than just a 3 bedroom home. It also offers a great community. Often times, a new job brings someone into a new community and Oklahoma City offers positions in many different industries. High tech industries in the biosciences and healthcare as well as aviation and aerospace call Oklahoma City home, as do large energy and manufacturing firms. A new resident may also find opportunities in retail or financial services. 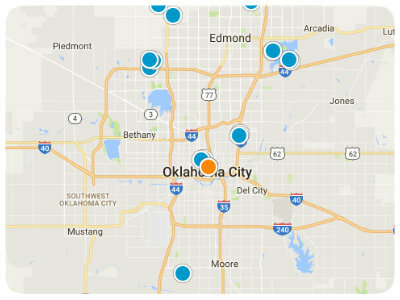 The accessibility of Oklahoma City is also a draw for many. It is accessible by four major interstates including I-35, I-40, I235 and I-240. Will Rogers World Airport, Wiley Post Airport and Clarence Page Airport all make Oklahoma City accessible to business and leisure travelers both within in the United States as well as to international destinations. Within the city limits, residents will find a parks and recreation facilities that include over 150 public parks and over 75 miles of biking and walking trails throughout the city. In addition, there are multiple municipal golfcourses, pools and tennis centers. These facilities can be used be all residents at their own leisure or they can take advantage of classes offered at these facilities. Additional locations of interest in Oklahoma City, Oklahoma include Kirkpatrick Planetarium and the Oklahoma City Zoo. The OC Zoo is considered by many to be one of the top zoos in the United States. It is home to over 2,100 exotic species on 110 acres, including a children's zoo, and state-of-the-art primate and lion exhibits. Another popular destination is the Myriad Gardens, which features 224- foot crystal bridge and a 15+ acre outdoor park with a sunken lake. The crystal bridge, combined with the story enclosed botanical gardens are home to over 1000 horticulture species from around the world. These are just a few of the locations in Oklahoma city that are frequented by residents and visitors to the area. In 2000, Oklahoma City made a strong commitment to public school education through the addition of OCMAPS, which is stands for Oklahoma City Metro Area Projects. This is a trust made up of individuals appointed by the Oklahoma City Council and funding for School district I-89, as well as several other school districts that service Oklahoma city. This includes a program known as MAPS for Kids, which includes the oversight of 70 new and renovated school facilities totaling $470 million in construction costs. This will be completed in the very near future. There are also future commitments for technology projects and replacement of school buses totaling just over 60 million. These expenditures demonstrate a strong commitment to schools by the local government as well as the residents. 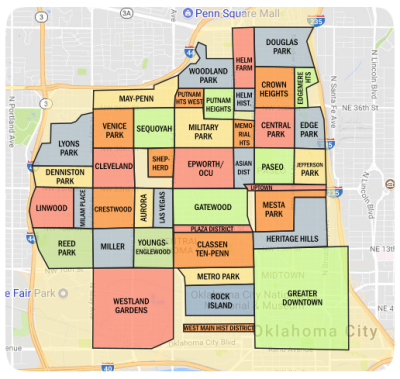 Buyers looking for 3-bedroom Oklahoma City, OK homes for sale will find the space they will looking for in a highly accessible location with career opportunities in various industries, outstanding park and recreation facilities and a strong value for education. Clean and move in ready!